I Completed My March Goals! Processing one document/source per week (if not more) into my RootsMagic database. Writing at least one blog post per week. Reading one genealogy book per month. Exploring one new technology per month. And taking one genealogy-related trip every two months. I did get in enough blog posts to average out to one per week, but that’s about it. I only got in a few hours of personal genealogy time last week — the rest of my genealogy research time went to a client project. Maggie came into my life 3 weeks ago and has been occupying a lot of my time (not that I’m complaining). 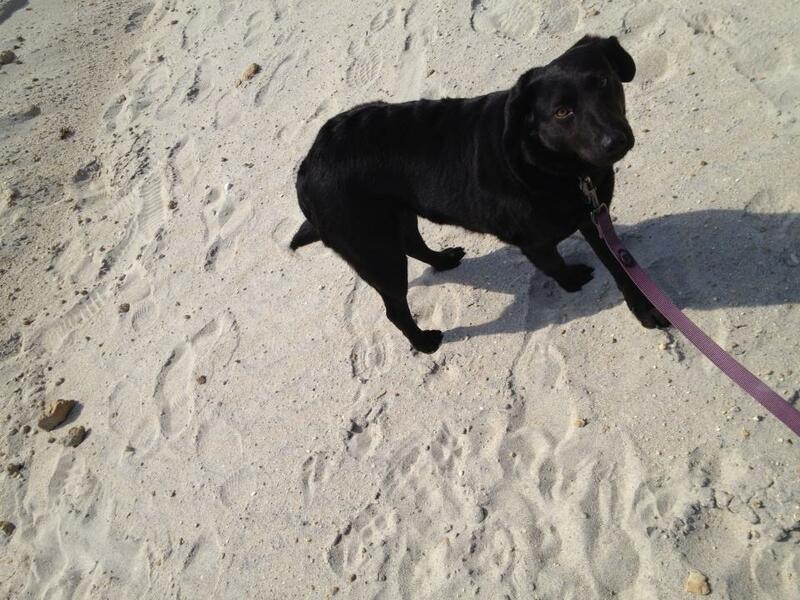 She’s a 1.5-year-old Lab-mix rescue and she is the best dog on the planet. February has come and gone and I pretty much missed all of my personal monthly genealogy goals. I’m going to continue to blame my client projects, as they did take up all of my available genealogy time. Not that I’m complaining too much. I love my client projects! Processing one document/source per week (if not more) into my RootsMagic database. I didn’t touch RM this month — need to get back to it. Writing at least one blog post per week. If you include my January recap post, my journaling post and a local history post, I only missed this mark by one. Phew! Reading one genealogy book per month. I’m not reading much in the form of books lately and that needs to change. I blame House of Cards on Netflix and the availability of some of my favorite History Channel shows on Amazon Prime. And myself. Exploring one new technology per month. Not genealogy-related, but I re-learned pivot tables in Excel at work this month. Does that count? And taking one genealogy-related trip every two months. No February trips, but I did register for the Washington Family History Conference coming up in May! Will I fare better in March? I’m going to be realistic and say no. I still have active client projects on-going and more work coming my way. My personal genealogy research is usually what feeds my blog, so if I don’t have time to research, I’m not going to blog. I am going to try and do better on the reading front. How’d I Do in January? Okay, okay, okay. It’s only February and I’m already behind on my January goals. But I do have good reasons. Processing one document/source per week (if not more) into my RootsMagic database. I got off to a good start the first week of January and added several items to RM. So, if you take the average, yes, I did add what comes out to one document per week. Writing at least one blog post per week. I only posted a few times in January. Explanation on why below. Reading one genealogy book per month. I read several chapters in a book on archival preservation, but didn’t quite make it all the way through. Not the book’s fault — I am taking the blame on this one. I need to really set aside more time for reading. Exploring one new technology per month. I actually have this one covered! More on that below. And taking one genealogy-related trip every two months. I didn’t go anywhere in January. We’ll have to see what February holds. 1) I was without my laptop for two weeks — I dropped it off with a local company to be suped up with a new hard drive, operating system, Parallels, and to have my old hard drive turned into an external drive. Could I have done all this myself? Probably. But it would have taken me even longer and no guarantee that everything would be working right. Unfortunately, the guy assigned to work on my computer caught the flu and was out for several days. That and waiting for parts to arrive meant a lengthy delay before I got my computer back. I relied on my iPad in the interim, but I really don’t like blogging on it. The good news is I have the laptop back now and it’s super-fast and up-to-date. 2) I started a new job. I’ve been getting used to a new routine and schedule and my personal genealogy projects have been on the back burner since the middle of the month as a result. 3) I picked up new client genealogy work. For the better part of a week, when I got home from the day job, I was on the clock for a client. This left little time to work on my own genealogy. The good news is that the client wants me to do more work on the project and I had a couple more inquiries from other potential clients as well. The bad news? I will still be delaying work on my own genealogy into February, which will probably mean I won’t be posting much new material on the blog. Now, for the new technology tool that I learned about this month. I needed to create multi-page PDFs for my client research project. You can do this in a program like Adobe Acrobat, but I found out about a different, free way to do so (as long as you have a Mac). You can use the Automator tool to create a script that will string together individual PDFs into one larger file. Read more about how to do it here. Let’s see how I do in February! 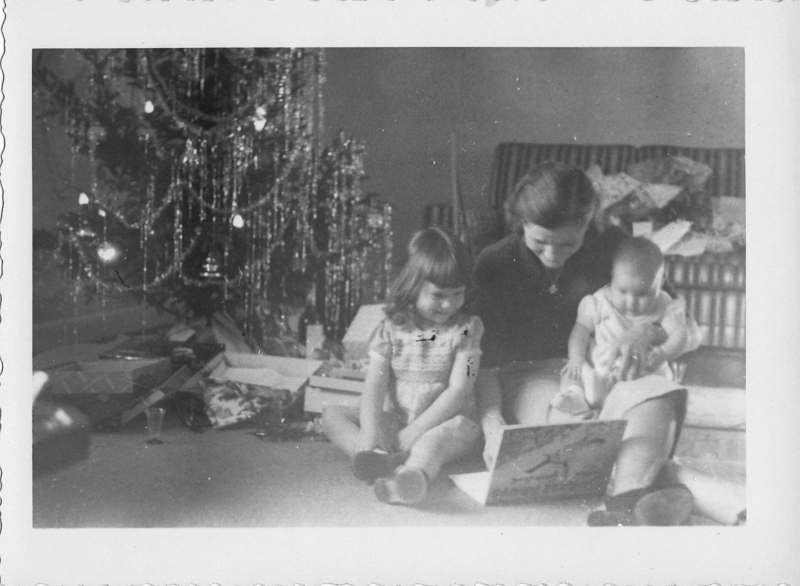 A few years ago, I participated in the Geneabloggers Advent Calendar of Christmas Memories. You can read my posts here. This year, I’m going to do something a little different. I recently acquired a bunch of photos from my mom’s childhood and a large percentage of the photos are from around the holidays. I’m going to try and post most of the photos following this year’s advent calendar prompts. Stay tuned for lots of 1950s holiday action. The fun starts tomorrow! No need to adjust your screen. 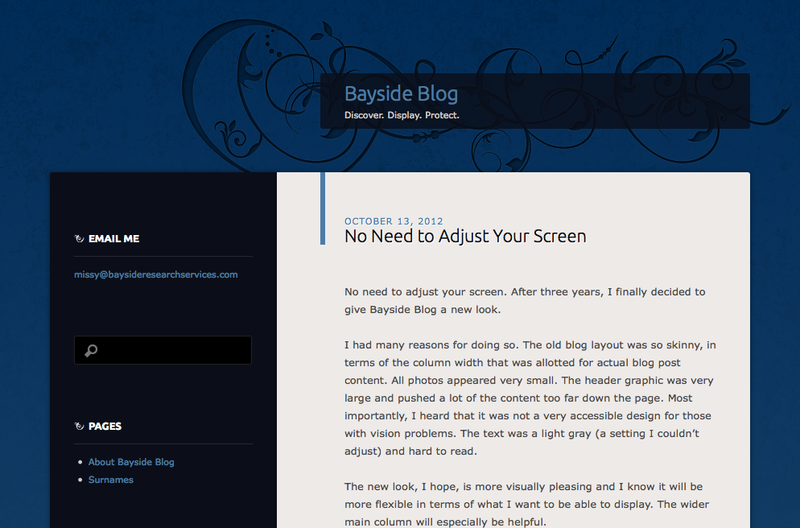 After three years, I finally decided to give Bayside Blog a new look. I had many reasons for doing so. The old blog layout was so skinny, in terms of the column width that was allotted for actual blog post content. All photos appeared very small. The header graphic was very large and pushed a lot of the content too far down the page. Most importantly, I heard that it was not a very accessible design for those with vision problems. The text was a light gray (a setting I couldn’t adjust) and hard to read. The new look, I hope, is more visually pleasing and I know it will be more flexible in terms of what I want to be able to display. The wider main column will especially be helpful. I’ve added a couple of new features. There is a link to my Facebook page for my house history section of my business. I also added a widget that displays the complete list blog post categories, for easier browsing.